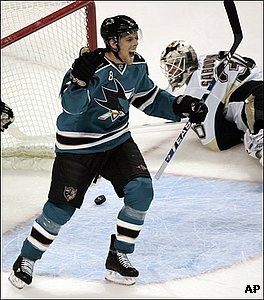 Joe Pavelski is a native of Wisconsin, a state known for its cheese, Packers and cheese heads. So when SJSHARKS.com had the chance to catch up with the Sharks 24-year-old center, most of the questions revolved around these Wisconsin staples. What is Pavelski's favorite kind of cheese? What does he really think of Brett Favre's move to the Jets? These questions and more are answered below in Pavelski's segment of Ask the Sharks. I think probably my strength. After my first year, I had to work on it. Being a smaller guy, it’s important for my strength to stay up throughout the entire year. It’s tough so I learned how to handle that better and hopefully every year I’ll keep getting stronger. 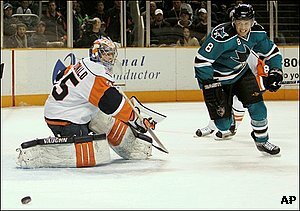 New York Islanders goalie Joey MacDonald saves a shot from San Jose Sharks center Joe Pavelski, right, during the first period on Saturday, Jan. 3, 2009. I only went to two years of school. I only took the core classes, but I was going for a communications science degree. I like all the basic cheeses like cheddar and mozzarella. My Aunt has a restaurant in Stevens Point and she makes these Italian Cheese Fries. It’s like pizza dough with a bunch of mozzarella cheese on it, but it’s the only place where you can really find them and they’re really good. But I don’t really have one favorite cheese. In high school I had the choice between the number eight and number eleven and I chose eight at the time. I really liked sixteen growing up because I really liked Brett Hull, but the number eight was always open at the places I was playing. I had some good success with it. I won a few Championships with it so it’s turned into the number that I like. It’s alright. The Packers are my favorite team for football. I’m not a die-hard football fan, but I enjoy watching them. I really wanted to see Brett Favre stay with the Packers, but at the same time, the Packers were moving on and so was Brett. I was really glad to see both teams kind of succeed. I know in New York they would have liked to finish better, but overall I think Brett had a pretty good time there and it was good to see him have a good finish to the season. And with the Packers, it could have been a little bit better, but they were competitive too. I wouldn’t really know of the sacrifices because I enjoy doing everything. Obviously I’m away from my family. Being from the Midwest, I don’t get to see my family. You realize it more at holidays. I have to make sure I spend a lot of time with my family when they’re around, but at the same time, this is my job and it’s one of the greatest things. I think any player really enjoys what he does. But really I wouldn’t look at too many sacrifices being made, I just have to take care of my body so I can perform at the highest level. That would be awesome. I’ve never been able to represent my country like that. There was one smaller tournament I was able to play in as a Junior player, but something as prestigious as the Olympics would be a great honor. It would be a lot of fun to go and play. You get to watch it on TV all the time, like this summer with all those great performances, it was pretty cool. But that is a long ways away and there is a lot of work to do before that happens. I really like to be outdoors. I like to go duck hunting and fish. It’s the best. It’s Polish. I don’t know what it really comes from; I know it used to be spelled P-a-w-e-l-s-k-i. There’s still a few people back home that still spell it like that, but when my family came over they changed the ‘w’ to a ‘v’. It’s really good. It’s fun. My wife and I are having a great time with it. We just got a new house. It’s our first house together.